When Joy contacted TheDiabetesCouncil, she wanted to know if she would ever be able to get pregnant and have a healthy baby with her Type 1 diabetes. She had previously heard that there were risks that came with being pregnant and she needed some guidance. We decided to put together a comprehensive guide which would shed light on pregnancy with pre-existing diabetes. We hope Joy and others who have similar questions concerns will benefit from the information provided here, as they work to get the strict diabetes control that is needed. Let’s take a look at what it takes to have a healthy pregnancy and baby despite having diabetes. In this article, we will look at how you can manage your diabetes during pregnancy for your health and the health of your baby. We will learn about the guidelines for managing diabetes during pregnancy, and provide you with a detailed instruction. 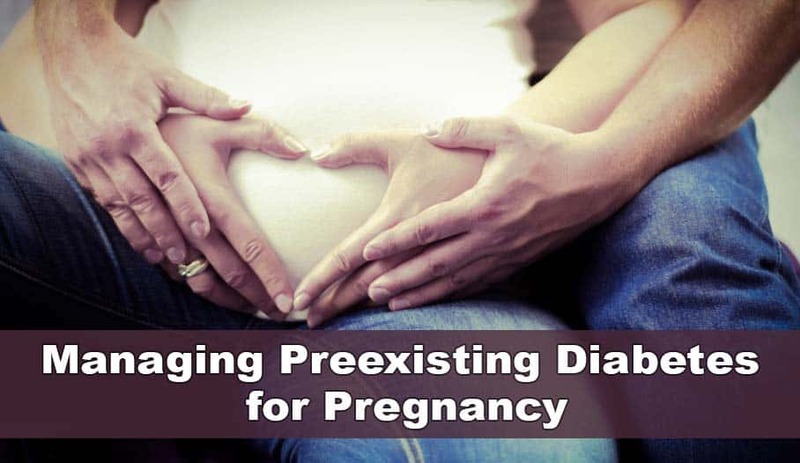 We will explore what women with pre-existing diabetes need to know before they get pregnant, and what they need to know in order to experience a healthy pregnancy with diabetes. Gestational diabetes, or diabetes acquired after pregnancy. Back in the 1980’s, I strongly urged all my teenage patients with diabetes to stay on birth control and prevent pregnancy with diabetes. The outcome was never too good when they got pregnant, had out of control diabetes, and the complications that would arise from the pregnancy. Outcomes are still grave if tight control is not achieved before and during the pregnancy. Fortunately, with organized management and strict blood sugar control, a healthy pregnancy is now achievable. Through the years, we have learned that it is not necessarily diabetes that poses risks to the developing fetus, but rather the presence of high blood sugars which is actually the culprit of the complications. When you get rid of high blood sugars, you decrease the chance of these complications arising. Therefore, by tight diabetes control, it is possible for you to have an optimal pregnancy, with a positive outcome for both the mother and the baby. The Hollywood version, from the 1980s movie “Steel Magnolias”, depicted the young Shelby, who was a Type 1 diabetic. The majority of the story centers on Shelby who gets married to Jackson, and has one bad bout of hypoglycemia in the mix of all the wedding activities. Near the end, Shelby gets pregnant, despite warnings from her doctor that it would be unsafe for her to have a baby. Following delivery of the baby, Shelby has zapped her kidneys and is on kidney dialysis. By the time baby Jackson is two years old, Shelby’s kidneys give out and she dies, leaving her baby and husband behind. A sad reminder of what pregnancy can do to the diabetic body, if tight control is not achieved. Today it is all about achieving tight control over blood sugars that mimic those of non-diabetics. This ensures a healthy baby. Tight control should already have been achieved in the first few weeks when the fetus is developing rapidly. This is why tight control should be a priority for women in pre-pregnancy plans. 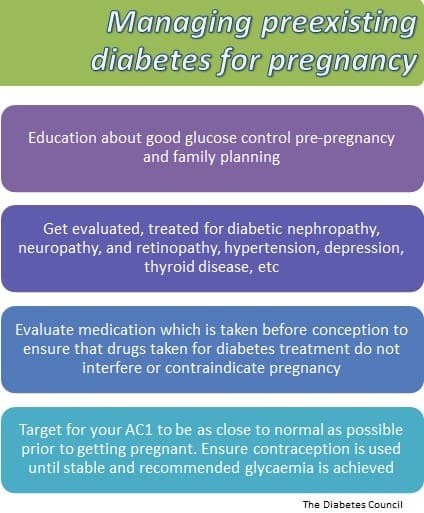 Therefore, women with diabetes wishing to get pregnant must work closely with their healthcare provider to achieve this optimal control over their diabetes prior to becoming pregnant. Cheryl Alkon, in her famous book Balancing Pregnancy With Pre-Existing Diabetes: Healthy Mom, Healthy Baby, reaffirms that the foundation of a healthy pregnancy with diabetes is tight blood sugar control. 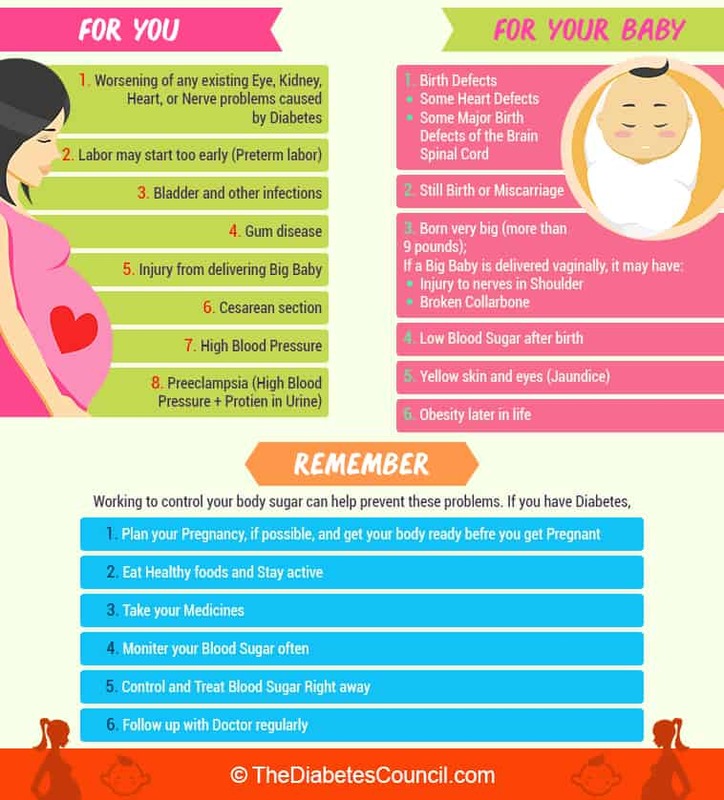 It is very important to have your blood sugars closer to a nondiabetic’s to have a healthy baby with no health problems. She further adds that it is imperative to get these numbers at the earliest stages of the pregnancy because that is when the baby is developing. The goal when preparing for pregnancy with diabetes is to reduce the risk of birth defects for the infant. High blood sugars and ketones in the body cross the placental barrier, and increase the chance of birth defects with uncontrolled diabetes. It is particularly important to make sure that tight control is achieved during the pre-conceptual period. The first seven weeks, when the baby’s vital organs are developing very rapidly, is an important time for blood sugar control. Therefore, pregnancy must be planned, and planned well. 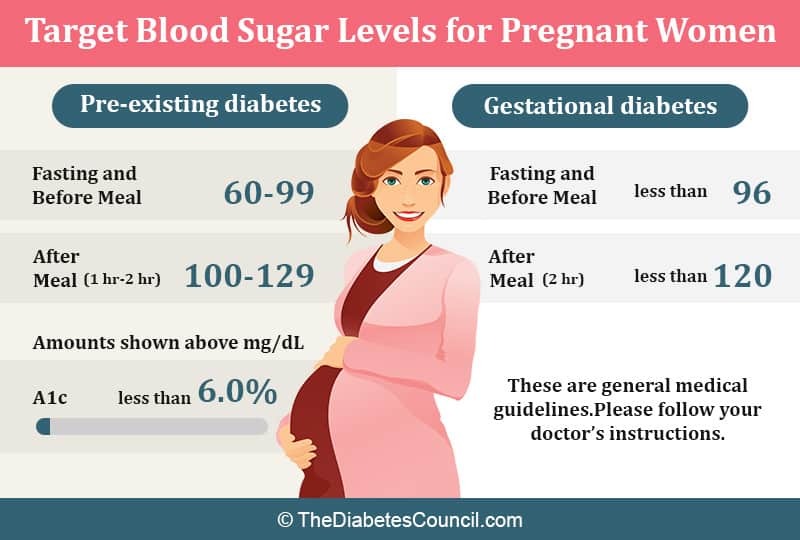 Blood sugars should be at acceptable levels before you get pregnant, and you should work with your healthcare team to make sure your body is ready for the pregnancy. 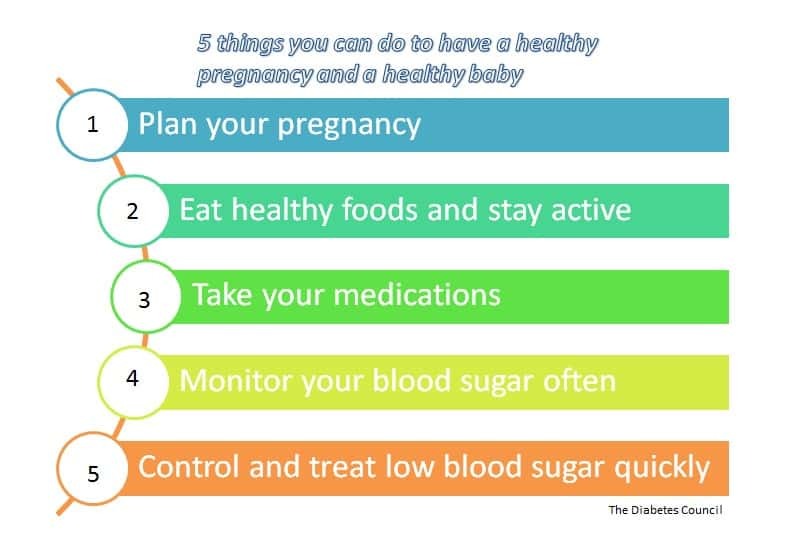 You should have your blood glucose levels in good control for at least three, and up to six months before you attempt to get pregnant. Why, you may ask? Because high blood sugars pose certain risks to the mother and baby. Using a planning checklist, or blood sugar spread sheet, may help you in organizing your blood sugars to achieve maximum control over your diabetes. You can access NIH’s planning checklist here: https://www.niddk.nih.gov/health-information/diabetes/diabetes-pregnancy#prepare. Before you get pregnant, you will need to get up-to-date on all of your vaccinations and have a Pap smear and physical. It is important to have check-ups for any sexually transmitted diseases, including HIV and syphilis. Talk to your doctor about any symptoms of depression, and stop smoking and drinking alcohol while you are in the preparation phase. Your doctor may start you on prenatal vitamins, including folic acid, iron, and/or calcium to help prepare your body for pregnancy. Speak with your provider about your plans to breastfeed your baby, and take a class that teaches you how to get a good start with breastfeeding. Apply for WIC services at your local health department to learn how to provide nutritional services and food during your pregnancy, as well as formula, and food for breastfeeding mothers following your pregnancy. According to authors Anne Dornhorst and David R. Hadden, hyperglycaemia is the cause of intrauterine fetal death and macrosomia and fetopathy during pregnancy. Therefore, it is important to ensure blood glucose levels are in tight control. Generally, the pre-meal and 1 hour after meal targets for blood sugar are the same as listed below, but check with your doctor and healthcare team for any individualized or specific goals. In addition, your A1C should be below 7 percent. Obtain a pre-pregnancy exam, and work with your healthcare team to develop a diet and exercise routine geared toward obtaining tight control over your diabetes in order to decrease the risks of complications. 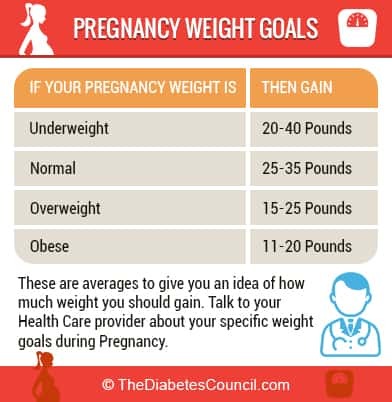 Make goals on what a healthy body weight will be for you before becoming pregnant. Additionally, have your healthcare provide review on any medications or supplements you are currently taking, and discuss whether or not you will be able to use them during your pregnancy, or if you will have to switch to something else due to possible risks they may pose for the fetus. 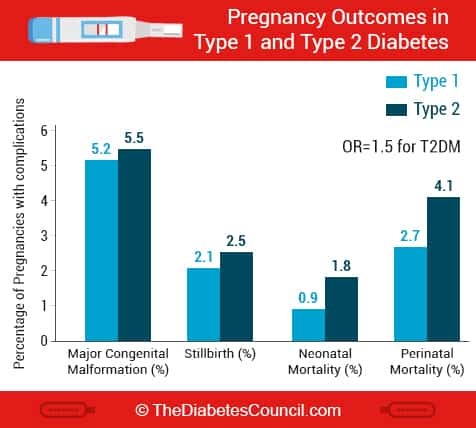 Once you are pregnant, because you have diabetes, your pregnancy will be classified as “high risk.” You will see a provider who specializes in making sure that high risk pregnancies have good outcomes for both the mother and the baby. Working with these providers will ensure that you can deliver a healthy baby, with little or no risks to you as the mother. You should monitor your blood sugars at least four times daily when pregnant. You will want to make sure that your meter is working well, and run any controls on your meter that are needed. Recheck blood sugars if they are not what you expect in order to verify high or low blood sugars. The National Institute of Diabetes and Diabetes and Kidney Diseases has a comprehensive article on Pregnancy and Diabetes where they call for you to check your blood glucose levels several times a day. You will have to talk to your doctor to find out what the appropriate amount of times is for you and when to check your blood glucose levels. Additionally, you will have to keep a track of each time you test your blood levels. You will want to use your blood sugar results to adjust your intake of carbohydrates, increase or decrease your level of exercise, or adjust your medications with your healthcare team’s input. During pregnancy, you are at an increased risk for low blood sugar, so you will have to plan accordingly, and keep your quick-acting carbohydrate snacks with you at all times, with a glucagon pen for severe low blood sugars. Make sure that family and friends know how to administer an injection if you were to need it in the event of a low blood sugar. If no glucagon pen is available, family, friends, and co-workers need to know how and where to access emergency services. Just as you always are when you are diabetic, you will be susceptible to high blood sugars when you are pregnant. Speak with your healthcare team when you need to adjust your medications, diet, or exercise routines due to a high blood sugar, or when your ketone sticks show moderate to severe ketones are present in your urine. To provide a bit more information about ketones, when you are pregnant, you will want to avoid ketosis, where your body produces waste products called, “ketones.” You will want to make sure that you check your urine every morning for the presence of ketone bodies that can lead to diabetic ketoacidosis if unchecked. This is especially true if your blood sugar is over 200 mg/dl. Due to the need for extra calories and protein during pregnancy, every pregnant woman with diabetes should seek Medical Nutrition Therapy (MNT). Most high risk clinics provide this service. Working with a registered dietitian who is also a Certified Diabetes Educator (CDE) will help you to make adjustments to your diet and nutrition that is right for you during your pregnancy with diabetes. A healthy diet during your pregnancy will help you keep your blood sugars in control, and within a target range. Work with your dietitian to ensure that you get adequate amounts of all nutrients during pregnancy, while maintaining blood sugars in a healthy range for the developing baby and you. In Management of Type 1 Diabetes in Pregnancy, the authors emphasize that during a pregnancy with diabetes, prenatal vitamins and folic acid decrease the chances of malformations in a baby. The pregnant mother must have her meals and snacks in consistent times. Snacks must be healthy and you must count your carbohydrates. All this will optimize glucose management. Your provider will likely start you on a vitamin and mineral supplement, or prenatal vitamin. It will contain adequate amounts of supplementation, and you will not need to take anymore vitamins, minerals, or supplements during your pregnancy. Folic acid, iron, and calcium are all highly important needed vitamins and minerals for fetal growth. You should check with your doctor before starting any medicines, vitamins, minerals, supplements, or treatments during pregnancy. You will want to get some exercise while you are pregnant, but you need to be sensible about it. Walking is a great, low impact activity. Swimming is easy on joints. Speak with your healthcare provider about the appropriate level of exercise for you during your pregnancy with diabetes. Generally, thirty minutes of activity per day is a good goal to aim for. If you want to do more strenuous activities during your pregnancy, always talk with your healthcare team first, and make sure the activity would not be contraindicated during pregnancy. Review all of your medications for diabetes and other conditions such as blood pressure and cholesterol with your healthcare provider. 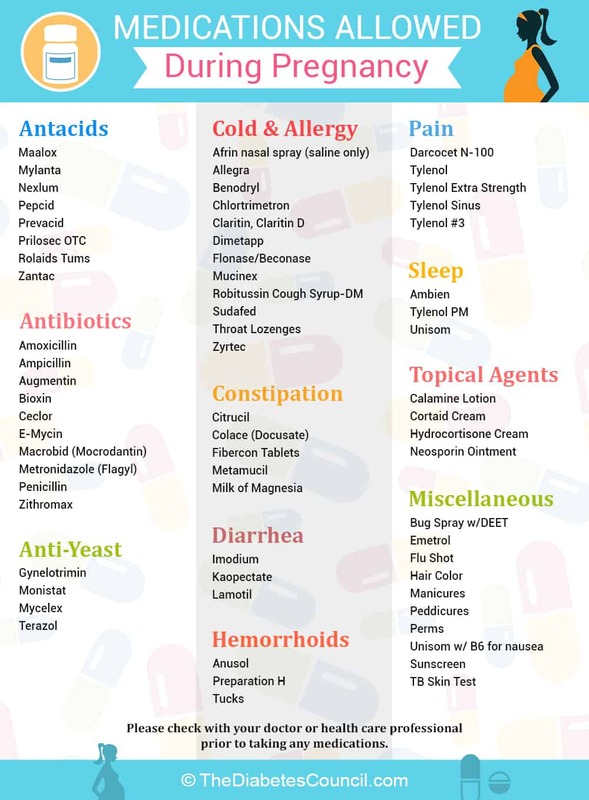 You will likely have to stop or change some of your medications under your doctor’s guidance. Insulin is generally considered the safest medication to use for diabetes during pregnancy, so you may have to take insulin instead of oral medication that you were taking before you got pregnant. Insulin needs will increase drastically in the second and third trimesters, so you will work continually with your healthcare provider to make sure that your insulin doses are in correct doses. It is possible that a woman with diabetes may be able to deliver a baby vaginally. If complications arise, a cesarean section may be necessary. It is essential to make sure that there is tight blood sugar control during labor and delivery. It keeps your baby from having a low blood sugar soon after birth. Insulin doses need go down for the mother during delivery. Nurses will be checking your blood sugars very frequently, and giving you fluids to achieve good blood sugar levels during labor and delivery. An insulin pump, if the woman with diabetes uses one, may be used during labor and delivery to achieve control. You can breastfeed your baby if you have diabetes. However, you will require more nutrients and calories than you usually would when you are not breastfeeding. Again, work with a registered dietitian to determine appropriate portions and amounts of carbohydrates during breastfeeding. If you are breastfeeding your baby, you will want to start soon after birth. Ask for a lactation consultant. Most hospitals have one. Communicate to hospital staff that you do not want your baby to be given a bottle or pacifier, until your baby gets used to breastfeeding. Talk to hospital staff about having your baby in the room with you after delivery to support your breastfeeding efforts. When planning to get pregnant with diabetes, choose a doctor and a healthcare support team with specific experience in delivering babies to a mother with your type of diabetes. Make sure they have a good record in delivering healthy babies to mothers with diabetes, and that they are familiar with the protocol. Make sure that those around you, including all extended family members, know that you have to restrict your carbohydrate intake during your pregnancy in order to have a healthy outcome. Your family and friends need to be aware that you must balance your intake, and this is not a free-for-all pregnancy, where you get to eat large amounts of carbohydrates. You want your aunt and grandmother to understand and support your pre-pregnancy and pregnancy diet. This makes life during the months prior to pregnancy, and the nine months of pregnancy less stressful for the mother and her family. Open lines of communication should be established, so that everyone is on the same page. Pregnant women with diabetes will need to stay away from environmental irritants, contaminants, and cigarette smoke. Family members should quit smoking as well, or smoke away from the home. Pregnancy is a good time for the whole family to learn and use healthy habits that they can continue for a lifetime. Choosing healthy, safe exercises during pregnancy is also important. Consult with your doctor and healthcare team for appropriate activities to do during your pregnancy. For a pregnancy with diabetes to be successful and the mother and the baby to be healthy during the pregnancy, it is important for the mother to have an effective care team which includes a doctor, a nurse, a diabetes educator, a dietitian and a social work, states David A Sacks in his book Diabetes and Pregnancy: A guide to a Healthy Pregnancy for Women with Type 1,Type 2 or Gestational Diabetes. We invite our readers to offer their input on this article in the comments section below. If we have forgotten any other useful information, please tell us. We strive to provide you with the most comprehensive and up-to-date information at TheDiabetesCouncil, and we hope that we are succeeding in our mission. We also welcome you to share any experiences you have had with being pregnant with diabetes. True stories enrich our content, and provide practical advice. Thank you for your input in advance.